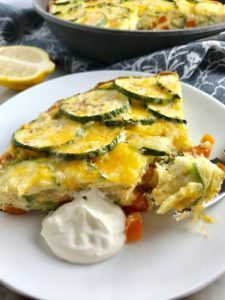 Eggs…Cheese…Veggies…Lemon Crema…a beautiful combination. 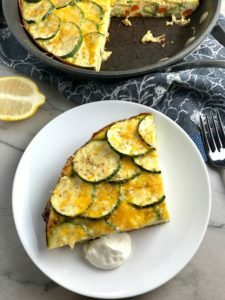 This Vegetable Frittata with Lemon Crema is the perfect one pan, summer dish. You can eat this for breakfast before work, pack it for lunch, eat it for dinner, or brunch on the weekend. 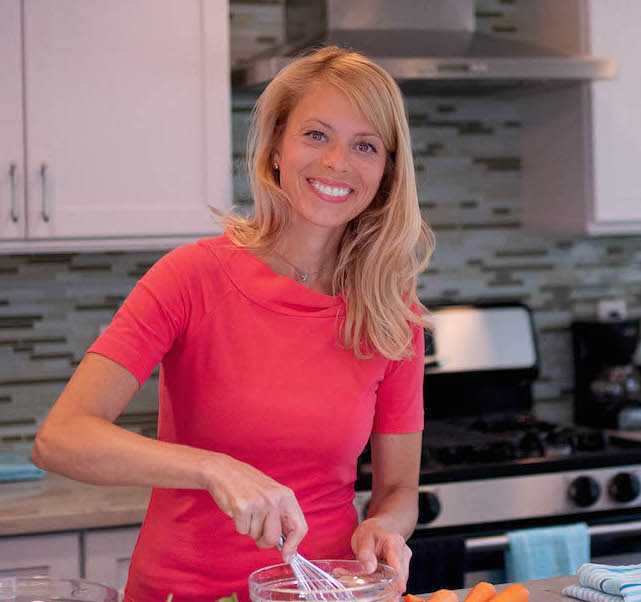 It has no boundaries, it’s like the super hero of recipes! 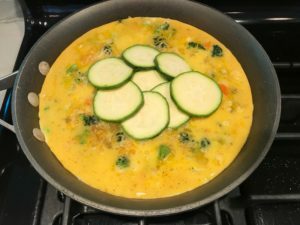 Vegetable Frittata with Lemon Crema starts with the veggies: Carrots, Broccoli, Cauliflower, Zucchini, and Scallion. Does this scream good-for-you or what? But don’t worry, there are plenty of eggs, some cheese too, to round out the dish and give it a creamy, buttery, nutty flavor. Then, top with a fresh, bright and zesty Lemon Crema, that needs only lemon, sour cream, salt, and pepper. It adds another layer of flavor that you will fall in love with! Finally, let’s get fancy… Doesn’t the zucchini spiral design on top look so pretty!? It is truly easy, takes just seconds to create, and will impress everyone! 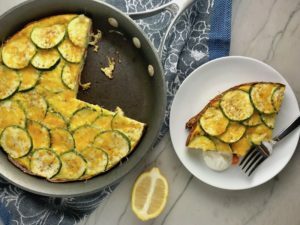 I just love this Frittata because (1) it’s DELICIOUS (2) it’s Gluten Free (3) you can really use up any veggies that you have in your fridge, so go nuts. You can also swap out the cheddar for another favorite cheese, like goat cheese, if you want. Finally, (4) it is E-A-S-Y clean-up! Only one bowl to mix the eggs and one pan to cook that starts on the stove and then moves to the oven. Of course, you need to prep the veggies, but do that in the day(s) ahead and the night you cook is no-muss, no-fuss! All of the vegetables can be prepared in advance, including cleaning, peeling, and cutting into small pieces. 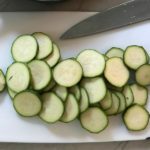 For the Zucchini, you want to slice it into thin rounds for layering on top. 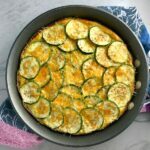 I love carrots, broccoli, cauliflower, zucchini, and scallions for this frittata because of the different colors and textures. You can really use any vegetables that you love or have on hand though. You can also make the Lemon Crema ahead of time and store it in the fridge. 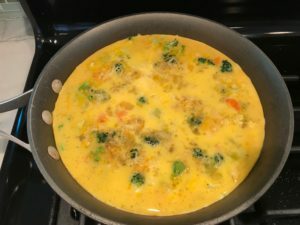 When you are ready to cook your frittata, you first make the egg mixture and set aside. 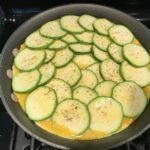 Cook the vegetables (not the Zucchini yet) in a pan until starting to soften. Sprinkle with 1/2 cup cheese and then add the egg mixture. Do not mix, just let the egg immediately hit the pan and start to sear on the bottom. 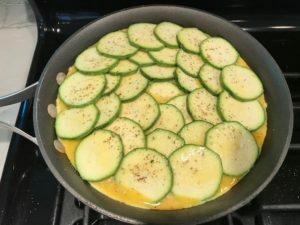 Turn the heat down to low and then layer the zucchini rounds starting at the center and working your way out until the top is completely covered. 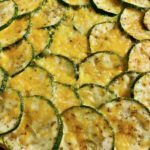 Sprinkle the top of the Zucchini with more cheese and then move into the oven to cook for 20 minutes. Test the center with a toothpick to make sure it is done. Serve with a dollop of the Lemon Crema…YUM! 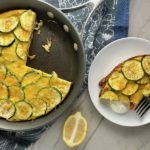 Vegetable Frittata with Lemon Crema is an easy weeknight dinner, quick breakfast, or weekend brunch recipe! 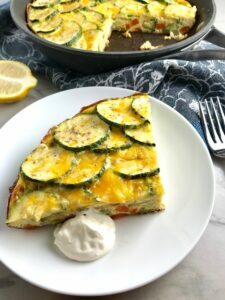 This Vegetable Frittata is thick and hearty with lots of flavors and textures from the veggies, but is also light and creamy from the eggs and cheese. 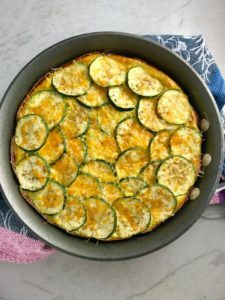 It's loaded with healthy veggies, is gluten free, and super EASY to make and to clean up after. Dice the carrots. 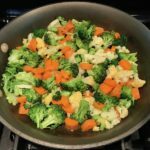 Break off the broccoli florets and rough chop them into small bite-size pieces. Break off the cauliflower florets and rough chop into small bite-size pieces. Slice the scallions. Put all in a storage bag in the fridge until ready to cook. Thin slice the zucchini into 1/8 to 1/4 inch slices. Put in a storage bag in the fridge until ready to cook. Make the Lemon Crema. Add the sour cream into a small mixing bowl. Zest the Lemon and add the zest to the sour cream. Cut the lemon into quarters and add the juice from one quarter. Add a dash of salt and pepper to taste. In a separate medium mixing bowl, crack the 8 eggs. Add the 1/4 cup milk, salt and pepper and whisk until all yolks are combined. Set aside. Preheat a 10" sauté pan and add 1 tbls extra virgin olive oil. 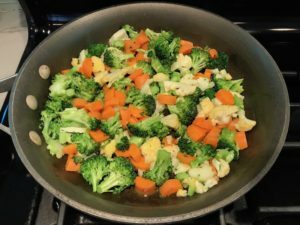 Then add the veggies (carrots, broccoli, cauliflower, scallions, but NOT the zucchini) to the pan, sprinkle with salt and pepper, then stir to ensure even cooking. Cook for 5 minutes stirring a few times throughout until starting to get soft. Sprinkle 1/2 cup of the cheese over the veggies. Pour the egg mixture over the veggies and cheese. Do not stir the eggs in, just let then sink to the bottom and get a sear on the bottom. 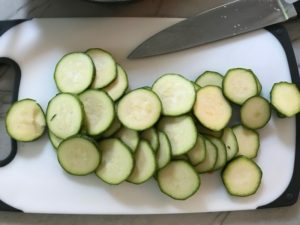 Arrange the zucchini on top in a flat spiral by laying 1 round slice in the center and then laying more slices around it in a circle and continuing to lay then around in a spiral shape until completely covered. Sprinkle the rest of the cheese on top. Put the pan into the preheated oven for 20 minutes. 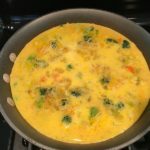 Test the center of the frittata with a knife to see if it comes out clean or if the egg is still raw in the center. If still raw, put it back in the oven for another 5 minutes and continue to test every 5 minutes until done. 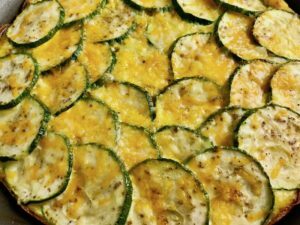 Remove the fritatta from the oven and let sit to cool before cutting. Serve with a dollop of the Lemon Crema and ENJOY!